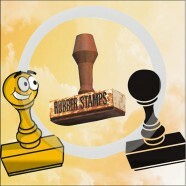 Rubber stamps are great tools to use for marking documents or designing stationeries. They can be used for affixing names or signatures to documents or for stamping your business logo. If you have lots of papers to sign, you could consider using a stamp to stamp your signature seal on all your papers. With our rubber stamp services, you just have to upload your preferred design and after checking it to ensure it is print-ready, we will create your own personalized rubber stamp for you. Our pre-inked stamps are great to use for both business and personal use. Each of our stamps can make thousands of impressions. You can choose between standard small, medium and large sized stamps based on the matter you wish to include in the stamp. We have no minimum orders to adhere to. If you make about 2 – 3 stamps at once, we will have it ready to ship to you within 2 business days upon placing your order with satisfaction guaranteed.